My calendar tells me it’s officially winter now, which may be what inspired me to start a log fire the other day (even though it wasn’t really fireplace-cold weather yet). 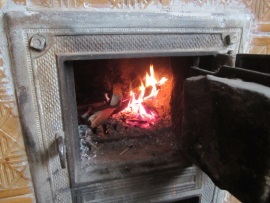 In fact, I’ve got another crackler going as I write this post, since I love fires so much. Again not so much for heat purposes as much as for the smell and sound (I suspect I’m not the only one who does this). Consider this introduction my roundabout entry into today’s topic–keeping warm in buggies. As an English person, it’s nice having an on-board combustion engine and some handy knobs to provide instant heat when traveling. When your engine has four legs it’s not quite so convenient. The last super-cold-weather buggy ride I took, I believe, was with Mark Curtis while paying a visit to his Ohio settlement. A heavy blanket kept us warm for the duration of that night-time ride, a trip down to a neighbor’s for supper. Though Mark doesn’t use a heater, his buggy, like most, is enclosed with a storm front, which I imagine must help tremendously. 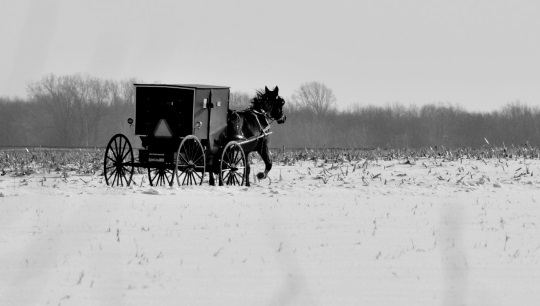 Pity those poor souls in churches which don’t use enclosed buggies – Swartzentruber Amish, Nebraska Amish churches, and the Swiss Amish with their open carriages, to name a few. Seems character-building, at the least. On that note, David Arment today shares a little anecdote touching on buggy heaters in the Elkhart-Lagrange Amish settlement. At the end, I’ve added a link to a post from last year explaining more about these heaters and how they work. My Amish neighbors, when I lived in Millersburg Indiana, would on occasion see one of my Amish buggy pictures. It seemed a game for them to figure out which buggy belonged to whom. And if there was more than one of them looking at a picture it seemed they had to find agreement on whose buggy it was. They always were in agreement although I was doubtful as they all look the same to me. He blinked at me in disbelief because in his mind nothing could be farther from the truth. “No that is us. That is our buggy and our horse”. I asked about heaters in buggies, because that picture (below) reminded me how cold it must be in those buggies. Lamar told me “yes” some people have heaters in their buggies. Lamar said he did not, which puzzled me because (as you know) it gets really cold here. Lamar said that the heaters were propane and he didn’t think they were safe. So, “yes” it is cold in the buggies. And, “Yes” they have heaters, but the benefit of staying warm is offset by the danger of death. Nothing ruins one’s day like not being alive when the day is over. I don’t know if the number of Amish who use heaters is greater than those who don’t. I’ll ask my friend Sam when I see him next. He gives buggy rides that start in downtown Shipshewana. If I were Amish I’d use a heater, because it is cold here in Indiana. What would you do? 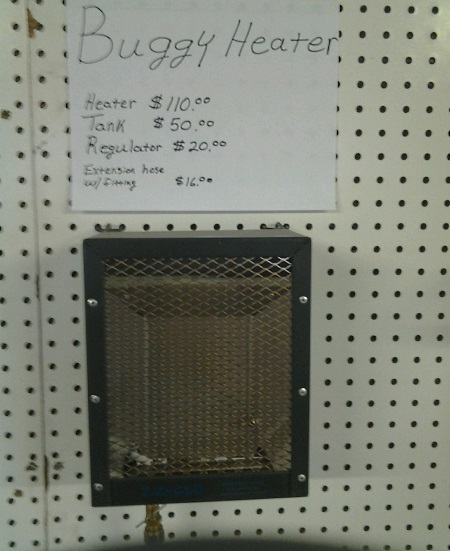 Here’s a photo of a propane buggy heater, shared last year by reader ShipshewanaIndiana, along with pricing. You can’t see it here, but it connects to a propane tank by a hose a couple-few feet long. They usually mount the heater in the middle of the dash. They run on propane gas and the the tank goes in the back of the buggy. Most buggy heaters are blue flame as opposed to infrared. Infrared heats by emitting infrared rays which nearby objects like buggy blankets absorb. I believe some do use infrared heaters in their buggies, but I know they are not considered safe. You’ll find that full post along with another photo here. And I for one will give a little thanks for another convenience I take for granted. One Sunday morning while living in Ontario it was cold. In order to stay warm and not freeze, I dressed in a heavy coat, shawl, wool scarf on my head, a bonnet, scarf around my neck, two pairs of mittens and knee high boots. I had stepped on the scale before I dressed to go outside and again just before I left the house. I weighed ten pounds more. It’s true, winter clothes do add about 10 pounds. And this is what I reminded myself, at least, at my last official “weigh-in” at the doctor’s. Unfortunately they don’t let you shed a few layers and re-weigh though. I would stay home if I where Amish and could stay home on the coldest days, if that where an option. I know from experience that, as a pedestrian and someone who is lucky to live in a municipality that has decent public transit, that clothing and layers of it (including good boots) are good things in the winter. Thank you Eric and David for a nice seasonal post! Every October, I do deer camp in a tent (many years in Lagrange County, as it happens). Let me tell you, in Lagrange County, even in October, it is already COLD at night, for someone sleeping on the ground with nothing between her sleeping bag and the wind but a nylon tent wall. Some tent campers use propane tent heaters. I don’t, because every safety expert I’ve ever read or heard warns up and down against the things, because of the danger of carbon monoxide. But one time I did poke my head into a fellow camper’s heated tent, and oh, did it feel luxurious! I’m sure a similar debate between warmth and safety goes on in many Amish buggies. Thank you for sharing this info. Very interesting article. And as you know, cold is a relative term. Growing up in Southern Ontario we had open buggies and no heaters and cold in Southern Ontario is colder than cold in Indiana. As a teenager arriving home after an hour and a half drive with three people on the open buggy, we would open the oven door on the kitchen stove and stick or feet inside until you could smell hot socks. I would eventually go to bed but still have cold feet when I awoke the next morning. It depends a lot on the buggy! Our buggy has a storm-front and roll-down curtains that snap in place. We do have a buggy heater that we got as a gift, but we found it to be too warm. In cold weather we dress warmly: I often wear an insulated vest under my corduroy coat and with good gloves, a heavy insulated fur lap-robe and the buggy closed up, I have yet to complain about being cold. We keep our robes in the house to keep them warm. My wife wears a wool head-scarf under her bonnet and with a thick coat & shawl, she’s warm, too. We bundled our children up much the same, tucked them in robes and tucked them in the back seat. In very cold weather we have used hot-water bottles, but it’s been years since we did that. The storm-front can get frosty, but we keep an ice-scraper & a cloth handy for cleaning the front and find that once body heat warms up the front, the frost seems to disappear. We do spray something on the front that helps keep it from freezing. Traveling by buggy probably sounds colder than it really is. 🙂 Think about cutters or sleighs — those might be colder but it never kept people from enjoying them yet! Thanks for the insight Mark! I’ve always wondered about the storm front fogging up or icing over and never think to ask my Amish friends as I mostly see they in the summer during hay season. Another thing I love to see is the Amish snow-mobile. It is common in our community to see a horse galloping down a gravel road pulling a young man in skis in the ditch as he holds onto a rope and tries to stay upright bouncing over snow drifts. Just like water skiing, except replace the boat with a perky horse and replace the water with a ditch full of snow. It really looks like fun! Four of us rode our bicycles from Wooster down into Holmes county for a 60 miles ride. Temperature about 28° to 30° and wind chill around 20°. I put a website here showing the map of the ride. put vinegar in warm water it defrost s window very easy..in spray bottle and old newspaper to wipe after vinegar no need for scraping.. I have heard or read that some keep warm by heating stones on their wood heaters and place them on the floor or under the seats and they will emit heat for a long time. With their blankets covering their lower body and the heat from the stones, they keep somewhat warm. Has anyone heard of this? In the areas that I visit most often, A Neveda order and an Old Order Mennonite order, I tried to sell warmers and buggy steps at a flea market last summer. The steps sold at once but I still have the warmers. My groups do use closed buggies but not warmers. I guess they just tolerate the cold temps and deal with it until they reach their destinations and warm up to the wood stoves. There is nothing like a wood stove to warm you up. It’s just the way it was meant to be. When I was a child my mother used to put clean bricks in a flat cake pan looking thing with enough water to cover them & then stick the whole thing in the oven until about half of the water had boiled away. Then she would wrap them in some old cloth rags and slip them into some small flannel bags that she had, before placing them under the covers at the foot of the bed. I think this was just sort of a ritual for her though, because we had natural gas heat and it doesn’t get that terribly cold where I grew up anyway. I never heard of them being used in a buggy, same concept though. BTW: I have the lap blanket that her parents used in their buggy, wagons and then early automobiles to stay warm, though about 10 years ago it started to completely disintegrate so it is only to look at now. No more using it to cover up with on the couch. RE: If I were Amish I’d use a heater, because it is cold here in Indiana. What would you do? I can’t BELIEVE that no one came up with what I would do. Thought for sure someone would beat me to it. Here is what I would do: I’d head out to Pine Croft, Florida and see how our friend Katie Troyer is doing! I’d hang out there until, I dunno … maybe April? LOL! Pine Croft sounds like a good option. But I’m afraid when I’m honest, I have to say that the option I “would” choose is the option I “have” chosen: Not being Amish! Loved the guest post. Thanks for sharing your humor. OldKat, I loved your keep warm plan the best. I wonder if any Amish wish to migrate to Hawaii. Well, I know I keep the heater on in my van. I asked Mark about his buggy. He said that he doesn’t have a heater in his buggy. He doesn’t think they are safe. He’s been in a few buggies that have them but not when they were on. He said that the heaters are only a few inches away from your legs. They are installed on the dash right in the front. The propane tank is under the seat. You have an explosive propane tank, flames, and a wooden vehicle. Not a good combination. If you horse decides to act up or shies at a snow plow you could have a right nasty conflagration. Mark says he just closes his buggy up tight. Also, he dresses in layers. He has a buggy robe that is fur on both sides with insulation in between. He says it’s not really as bad as some people think. He said he can remember as a boy getting in the car when we started out with not enough warm clothes, cold vinyl seats, and an ice cold car. That was cold!